The solo and team time trial Hamburg - Berlin is the seasons closing event of the Audax Club Schleswig Holstein. 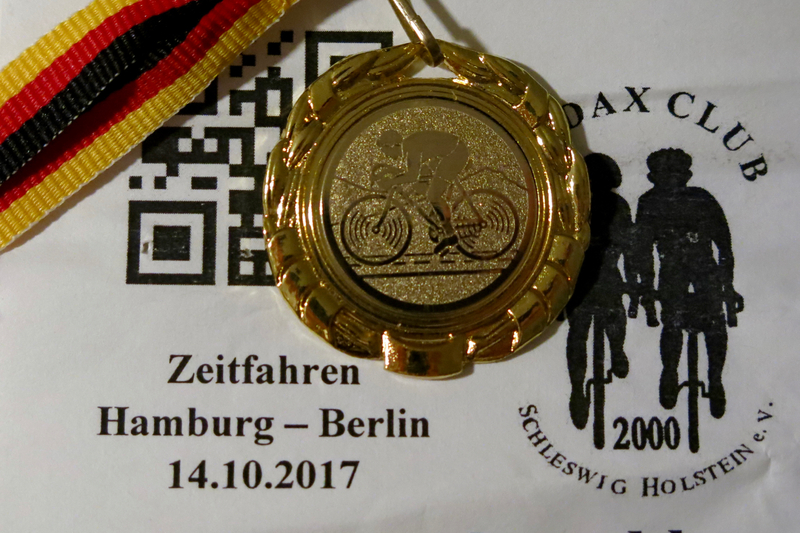 An inspiring mixture between brevet and race. Its long enough to get brevet riders like myself interested, yet short enough to attract the fast racing crowd and triathletes. 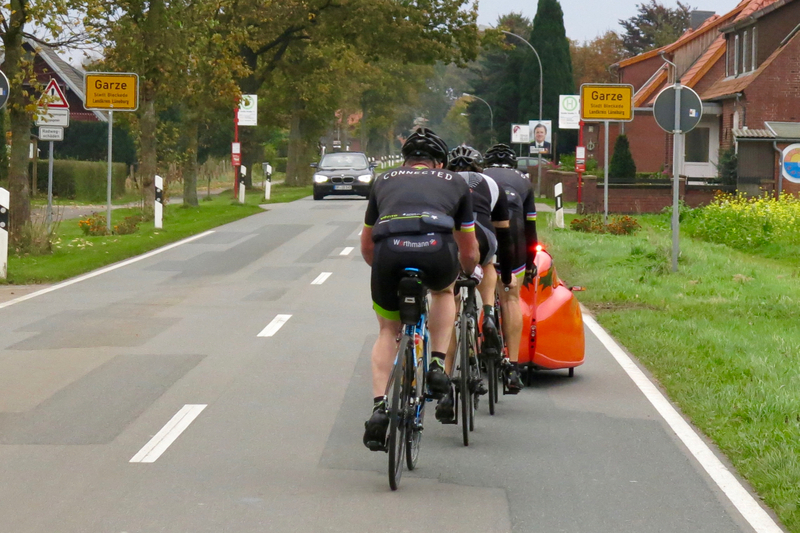 The course profile lets recumbents and faired HPVs play out their strength, and the fierce but friendly competition among them makes it feel like their informal championship. Accordingly there was a selection of the finest human powered vehicles on display, ranging from classic randonneur bicycles to the latest velomobiles. For my part, I rode the Pass Hunter. (VO Pass Hunter build). S21 to Bergedorf. 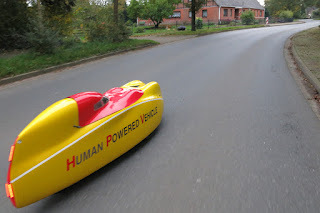 "Powered by Nature"
The rules are pretty simple and leave a free choice of itinerary, as long the propulsion is human powered, traffic rules are respected, and two bridges over the river Elbe are crossed exactly once in the correct direction. 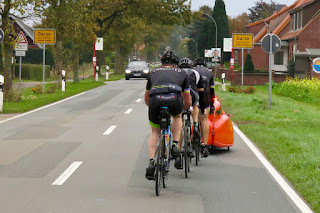 The event is characterized by a mixture of nice touches on one side, and professionalism in its complex organization, that is executed entirely by the Audax Club SH on the other side. 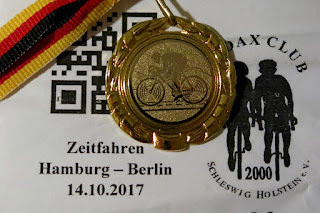 The inscription is literally worth the money, as it includes a generous breakfast buffet at the start in the Curslacker Landhaus, food, coffee and water at the only control in Dömitz, and luggage transport to the finish, where cheap beer, barbecue, and more excellent food wait to celebrate the days adventure. 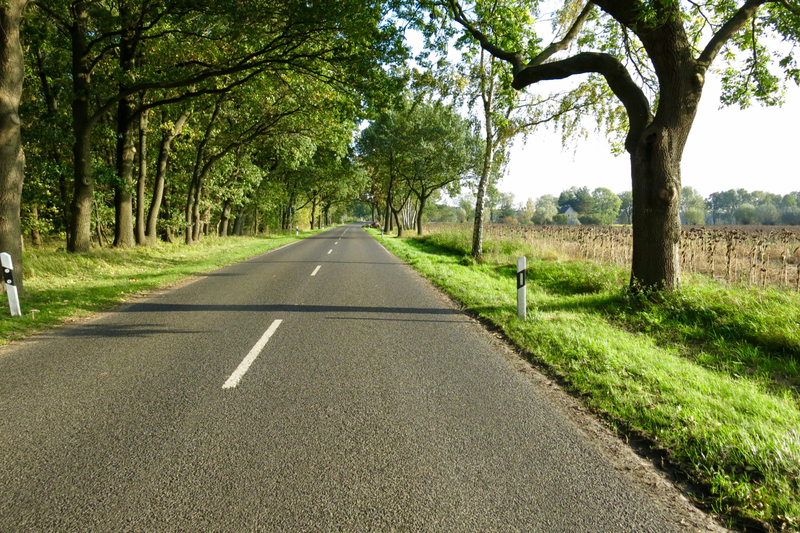 The landscape along the Elbe has some marvelous stretches, and this year it was possible to actually enjoy it. Hamburg Berlin has a certain reputation for its autumnal weather, but this edition was the exception confirming the rule: The weather was dry, warm, and a steady tailwind procured a feeling of smooth sailing. A welcome change after last years laborious ploughing into a consequent headwind accompanied by light rain. 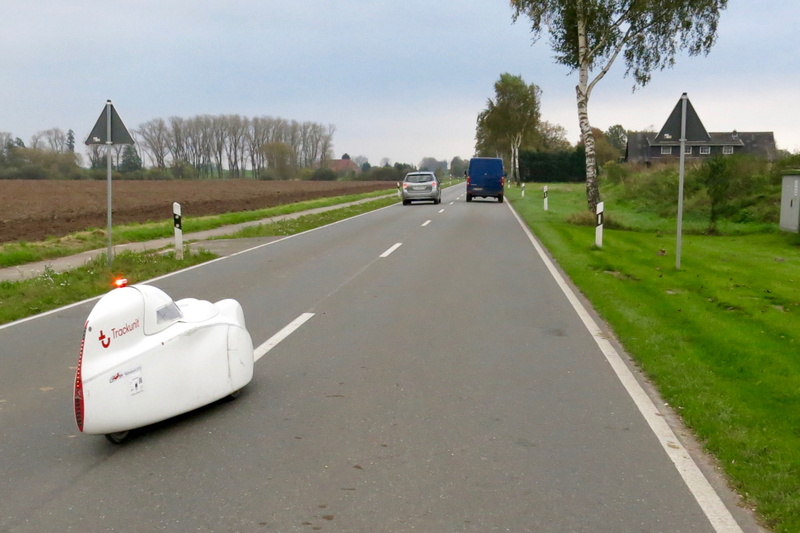 On the road on the first leg. 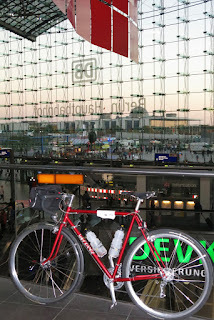 Mainly 'Elbuferstrasse'. 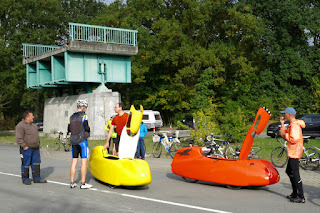 I had a late start at 7h44, and was quickly passed by a number of velomobiles, even though most of them had certainly chosen the latest possible starting times approaching 9h. 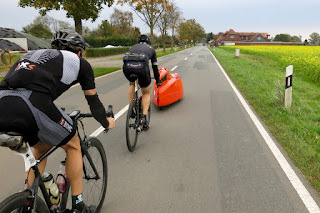 No surprise, as the fastest hold average speeds around 50 km/h against which my 29 km/h for the first 95 km to the control in Dömitz are ridiculous at best. 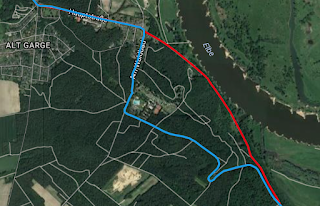 After mainly following the Elbuferstrasse, unsure whether the damage of Sturm 'Xavier' the week past had been cleaned up, I headed up the first hill in Alt Garge where I had cut through the forest last time. 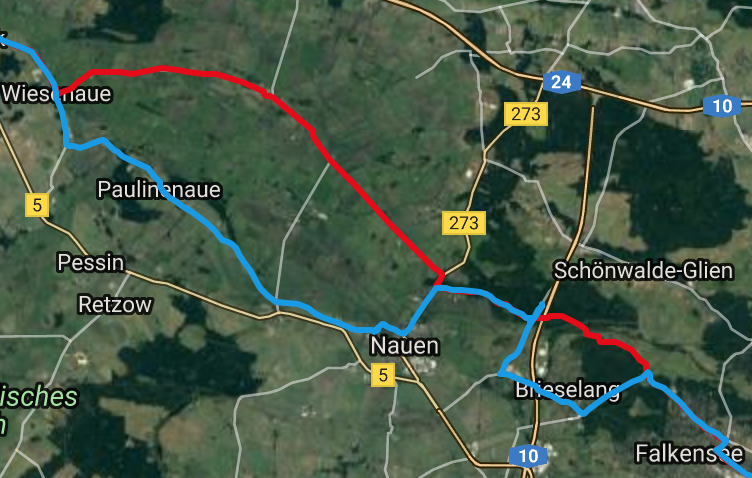 had cut through the forest last time (red). And who wouldn't invest a few hundred additional meters and a little climbing to take advantage of the only real switchback in 285 km? uprights on the first leg. Single rider, - but the event is draft legal among participants. 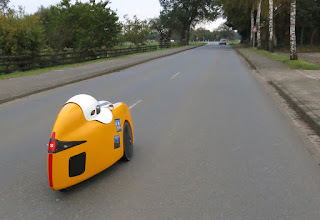 Drafting a velomobile. Does it help, and for how long? 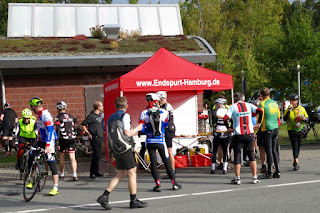 On the first col of the 'mountains' of Hitzacker the organizers had prepared a surprise feed stop for those choosing this route. Too early for me after the second breakfast at the start, I headed on. Tiny hills close to Hitzacker. 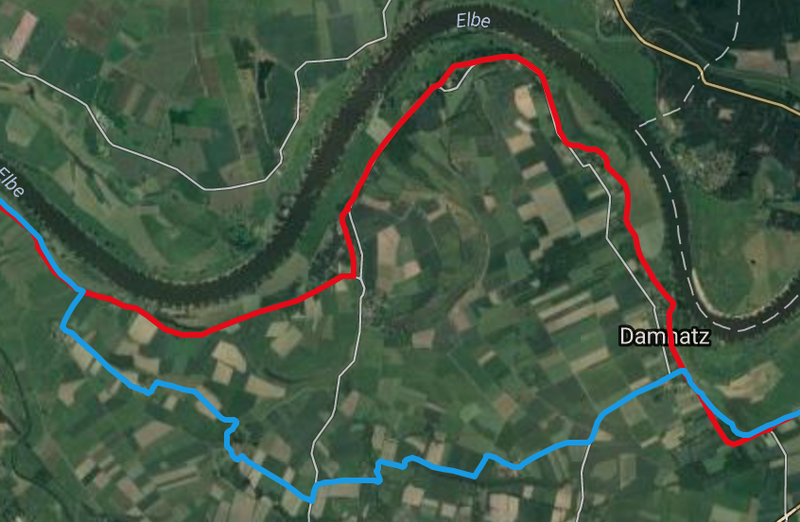 Approaching Damnatz I decided in favor of the seemingly shorter zigzag through a maze of fields and farms where I had followed the meander of the Elbe last time. 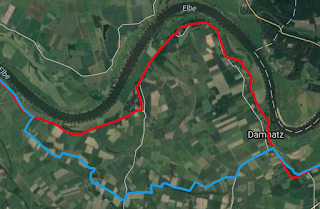 followed the meander of the Elbe (red). Approaching the control. Bridge near Dömitz. 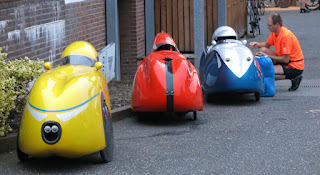 A velomobile being scanned by the organizers. 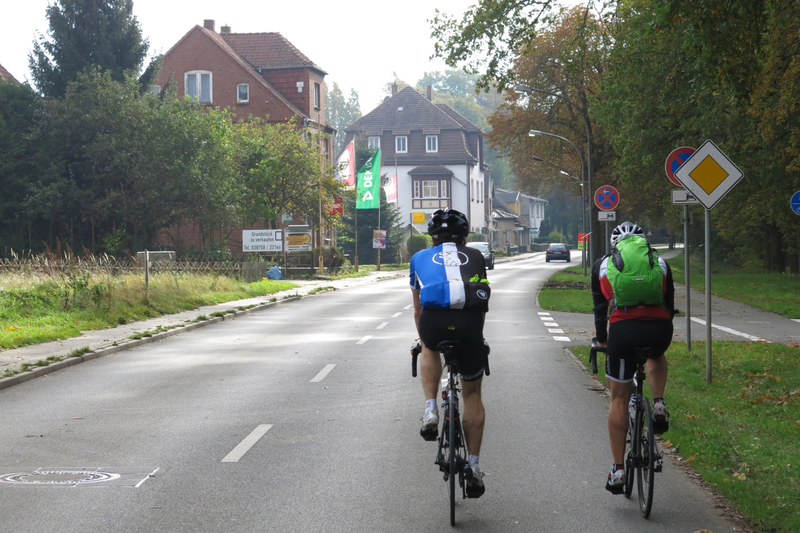 After 3 h of comfortable riding with comparatively little effort, the second mandatory passage south to north over the bridge in Dömitz appeared in sight. The organizers provided some food and water at the control. Velomobiles at the control - for some the only stop. 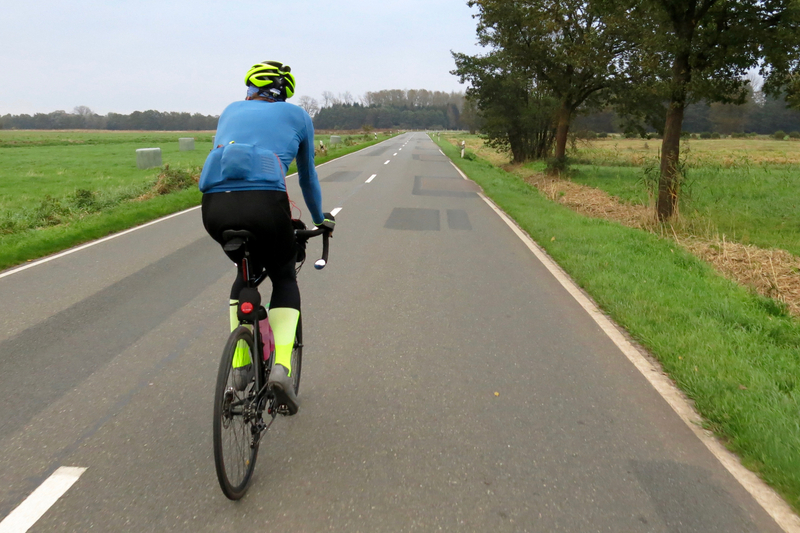 Being a slow rider, I spent just a few minutes at the control to refill my water bottles, and enjoyed a short coffee and half a banana. 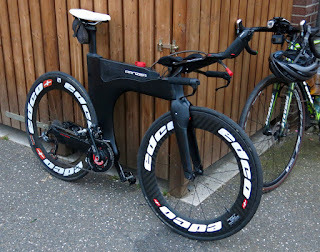 Its a single stage event, the clock is always ticking, and it pays to be efficient in average. 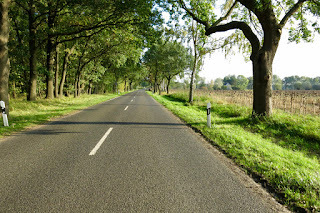 ... linked by scenic backroads without traffic. Most went without any luggage. 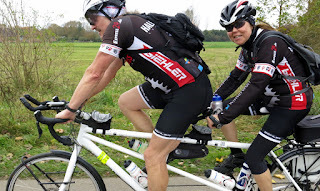 After some time I catched up with the well equipped race tandem, that had left the control just when I arrived, and wondered how our weathered vintage Peugeot TM8 that spends the weekend in the shed would fair on this course. 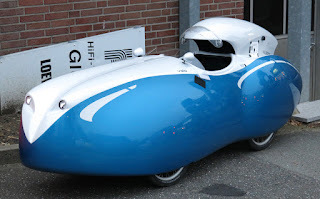 Peugeot TM8 that spends this weekend in the shed. I found the way to the dike, that I had missed last time, unsure whether the gravel route continues, and after I had seen other riders decide against. 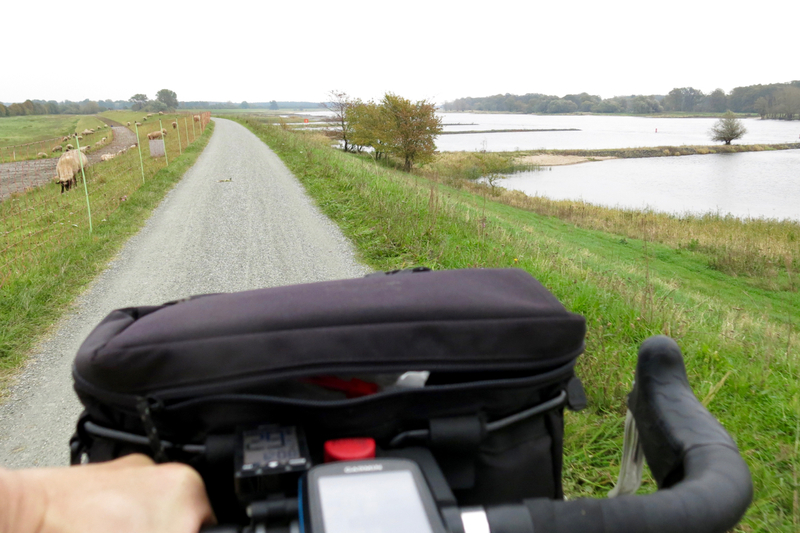 Its one of the beautifully desolate places, and the gravel path on top of the dike was fast rolling in the dry conditions. 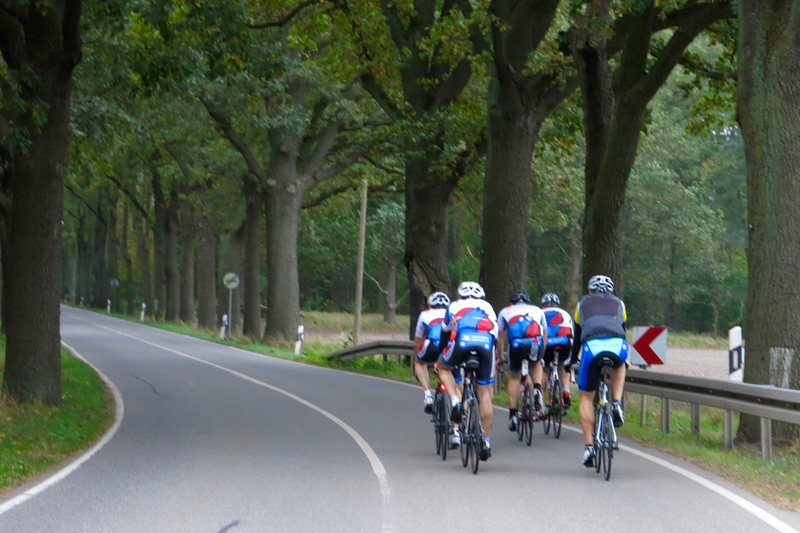 Many riders follow a route close to the Elbe for quite some time. Back then they were watching us. cat and mouse for some time. 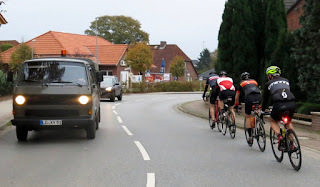 I had been passed by many fast riders in the first leg, and to my initial surprise quite some of them now overtook me once again, a few even more than twice I believe, but its hard to distinguish riders with identical jerseys form clubs participating with several teams. 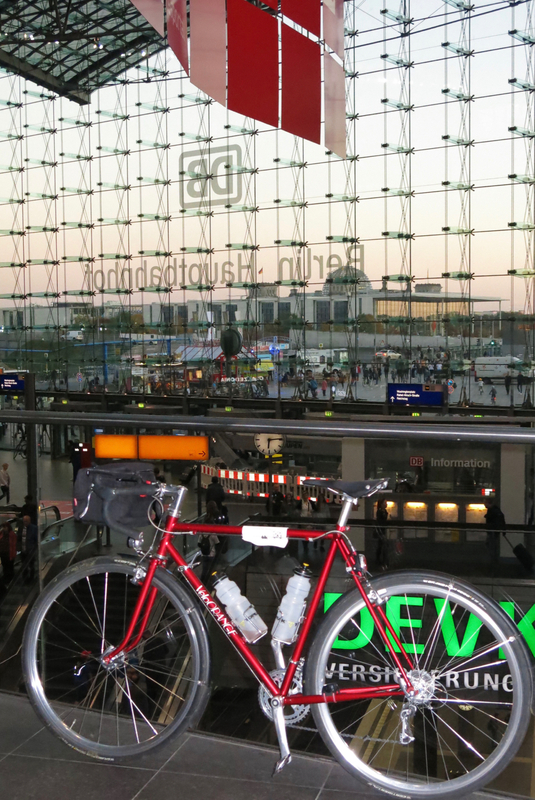 They were already greeting me as 'le randonneur' for my conspicuous steel bike, front luggage, leather shoes, and unshaved legs. 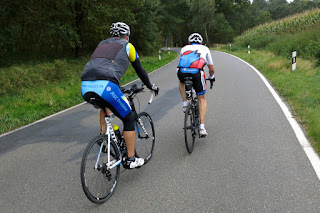 Wittenberge - about half-way out. 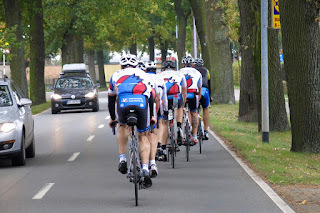 I was passed by many riders. 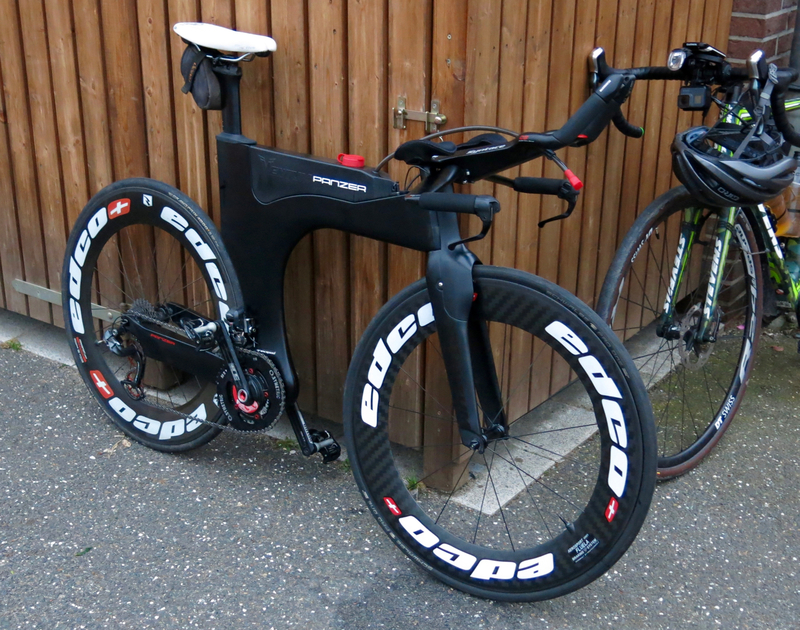 Yet it shows, how different equipment-, route-choices and stop strategies can partially even out on a long event. Speaking of strategies, I have to admit, that I didn't have any this time and therefore rode a two stop strategy. 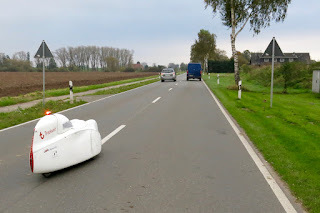 I was hoping to find a gas station along the route in Havelberg, and got a little nervous heading into the rather deserted Havelland with little water left in the bottles after none had materialized. 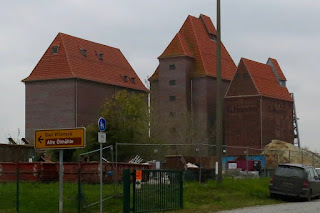 The Aldi in Friesack was still a long way to go. Just when I was about to run dry, the NP in Rhinow came to my rescue and I refueled with bottle of water, a coke, and a pack of 'Marzipankartoffeln'. purpose too. Honi soit qui mal y pense. 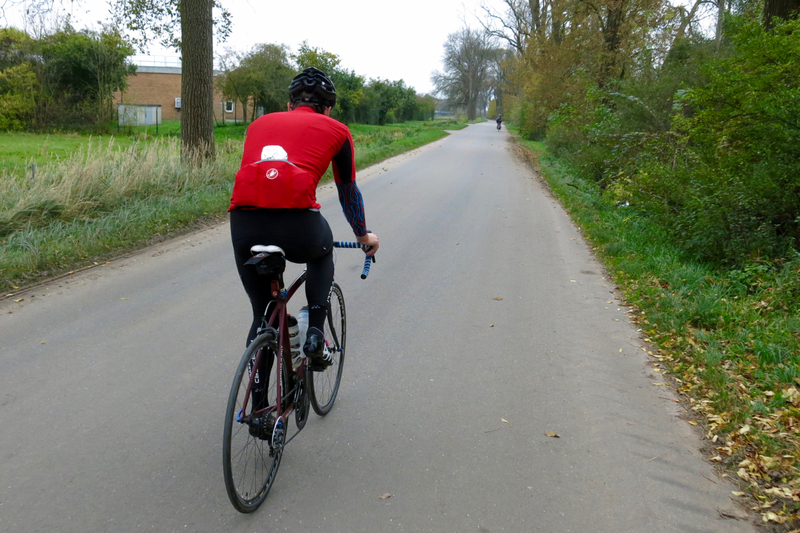 The Havelland is full of beautiful alleys. 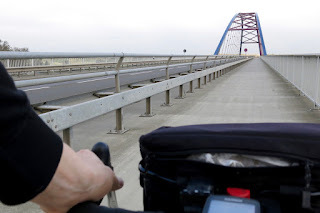 Just on the last stretch, when I already thought I had made it, a roadsign unambiguously told me that I wouldn't cross the Havelkanal right here because of construction work. 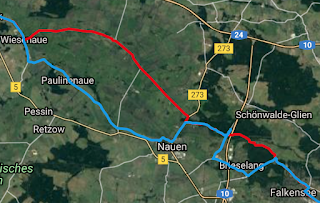 I followed the deviation, only to realize it might use the highway. I turned around a second time laboriously rerouting myself with the tiny screen of my GPS. 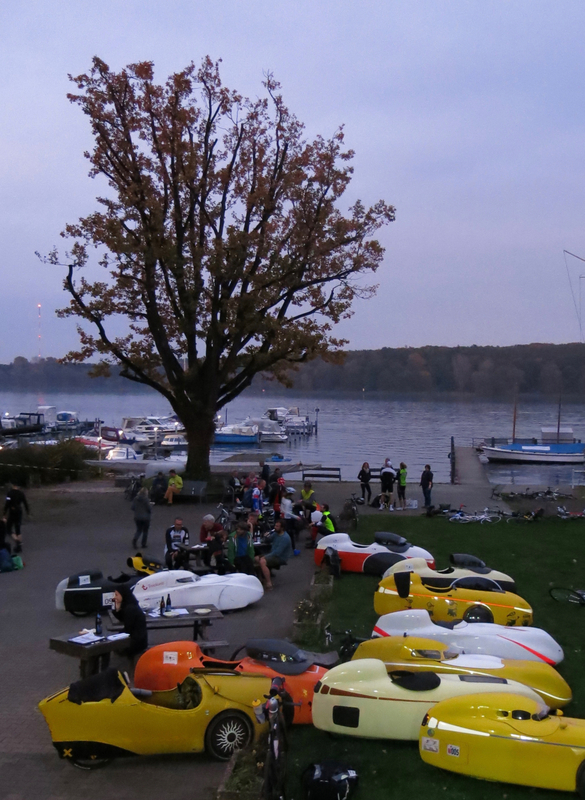 After a number of Berlin's traffic lights wearing my patience, I finally reached the Wassersportheim Gatow after 10h33 in the rapidly fading light of a beautiful day. 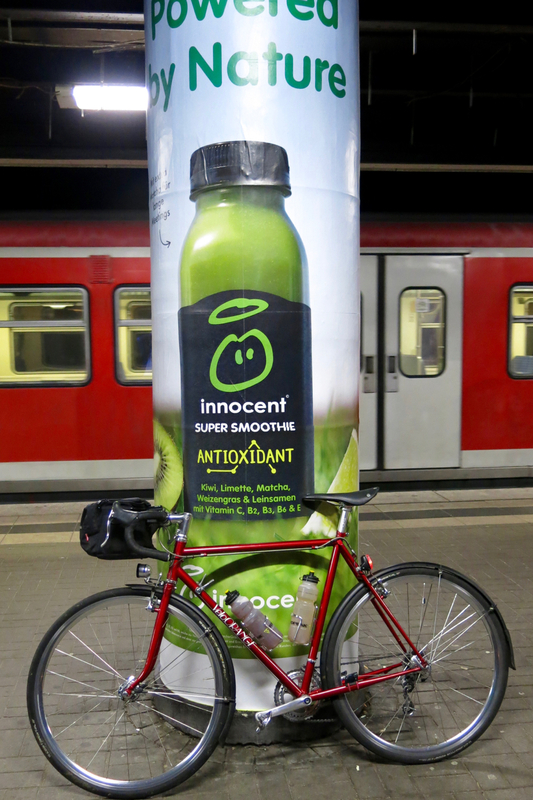 Way home from Berlin to Hamburg next day. and professionalism characterized the entire event.